Integration with Microsoft Active Directory allows you to authenticate users to log into Docsvault using their Windows login name and password. Users can also log in to Docsvault automatically once they log in to their Windows session. If you are running a small to medium-sized organization with large number of users, it can be quite time-consuming and frustrating to configure and maintain a separate list of users and passwords for various applications used in your company. Docsvault allows you to import and authenticate selected users from your Active Directory helping you save time and headache while still allowing you to use Docsvault’s internal authentication if required. 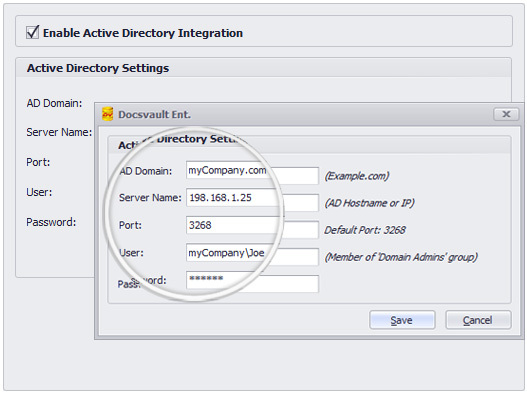 Active Directory Integration will allow seamless logins of specified active directory users into the Docsvault system. You can enable AD login with the help of your AD username and password. Only users with admin rights can enable AD integrations. Drag and drop documents, cut-copy-paste or save files into Docsvault from any application you are using. Save, share, review and manage all Word, Excel and PowerPoint files as well as Outlook emails.